The 15th edition of the "Medical Knowledge Self-Assessment Program (MKSAP)" is a completely new, original body of scholarly work, written by experts in each sub-speciality of internal medicine. It is published in a set of 11 books with a cumulative index. The innovative digital format enables you to work at your own pace from multiple locations. Work online, or even offline with the convenient CD-ROM. To synchronize your answers between the CD-ROM and Online format, simply upload your answers from the CD-ROM to your personal account online. Log on to any computer and continue where you left off. Find out instantly whether you have answered the questions correctly and see how your peers responded during a special pretesting period. Link directly to the section of the syllabus that relates to each question - immediately. 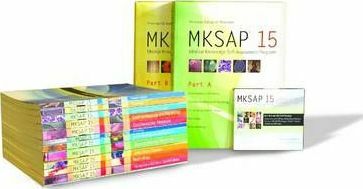 "MKSAP 15 Digital" is available for both PC and MacOS users. You can also answer "MKSAP" questions from your iPhone or a Web-connected Smartphone and have your answers stored directly in your "MKSAP 15" online account so that they will be there the next time you log on. "MKSAP"'s questions are frequently described as 'the best self-assessment available'. "MKSAP 15" is specifically intended for physicians who provide personal, non-surgical care to adults, including: general internists and primary care physicians; subspecialists who need to remain up-to-date in internal medicine; physicians preparing for certification exams in internal medicine; and, physicians comparing their knowledge to that of their peers.